Put your Category 1 tractor to work! Tear through hardwood branches up to 4.75" in diameter. Big hopper accepts side branches to minimize pruning. PTO shaft included. Extended discharge chute available. Devour branches up to 4.75” thick! This quick-connecting 3-Point Hitch Chipper will give you another way to capitalize on your tractor investment. DR self-feeding technology makes it easy...just drop a branch in and go for the next one. No need to force feed. We provide a PTO shaft with the DR Chipper to simplify connecting and disconnecting. You can use it with any Category 1 tractor. The big opening for branches (17” x 27") accepts 4.75” branches with little or no trimming of side branches. Hopper Opening Size 17" x 27"
I've only had my new toy for a couple weeks, but I can already see it's going to be a valuable addition to my equipment inventory. I'm so glad I got a chipper that will run off my Kubota's PTO. It does change the way I use my chainsaw when I'm cutting down a tree since you need to cut off more of the side branches off the limb. You'll want a good lopper handy too. I didn't get the chute extension but may add that later if I decide I want to catch the chips in a trailer. It does leave a pretty nice pile without the extension that is easy to scoop up with the front end loader on my tractor. Good work DR. A well made machine. This was a great addition to the tools I use around my property. This chipper worked flawlessly. It only took a few minutes to put the few parts together. I’ve rented chippers before and the one thing that irritated me was that it would slow down as you fed the machine, not this one! With it running off your PTO you never slow down! It handled limbs and small trees 4” thick without skipping a beat. This is my 2nd DR purchase and as with the 1st purchase it works as advertised. I recommend this product to anyone especially if you have a sizable property. I just have too much limb work with all the trails and the downed trees that you have to deal with from time to time. This was the best option for me. The other option is to burn but now I have mounds of wood chips that will go back into the soil. I bought your PTO wood chipper last summer. I wasn’t sure I would like the big chunky wood chips it made for use as bedding, but I do. The deep layer absorbed stuff but the chips were super easy to fork out of a coop or tractor-bucket out of larger areas. The chips are chunky enough to move around under animal weight or with the chickens’ scratching, and allow stuff to sift down and mix together, instead of compacting into an impermeable layer on the top with unused dry chips underneath, like boughten chips do. Must chip everything available this year to make bedding pack base for all the animals next winter goat, horse, pig. There’s a huge stack of limbs we didn’t get to last fall, and there’s always tons of trimming, thinning, and fallen tree cleanup to do. And then there’s the neighbors’ properties which are just as overgrown as ours. I don’t anticipate running out of chipable material in my lifetime ?? Easy to use and obviously towable on the tractor to wherever limbs are stacked. Noisy as heck, wear hearing protectors. Chews up green and seasoned pine limbs and small trunks in no time. It does tend to pass the needles long Ponderosa needles through unchopped. With the extended chute, it blows the chips into my truck bed so I can transport them where I want. Running this off the PTO is great. It never boggs down and runs like a champ. Great purchase really glad we got it. Jammed up the discharge first time I used it, had to disassemble and remove chips by hand. I thought it toasted the belt, but so far it is still working. Little worried that could be a fire hazard in late summer. Fed it less and have not had that reoccur. Cannot use a quick hitch due to spacing of lower arm pins/bracket. Has helped emmensly! Our farm was left by previous owners in pretty rough shape. A lot of invasive trees and shrubs. This has made short work of the brush. great product for tree of heaven up to 4 thick. This chipper works great. It’s a beast that easily chews up brush as big around as your arm. Easy to hook up and operate. Disappointed in warranty and service. Bought this chipper last July and used less than 15 hours. Wet to us it again in April and wen I engaged PTO, the U-joint on the PTO shaft broke. Was advised by company this s not covered by warranty, and they cold not supply the U-joint, could only sell me a new PTO shaft. Could no even supply specs. for the U-joint so I could get parts elsewhere. Guess they just want to sell me another 300 plus PTO shaft with no warrat. I will revise my rating once I get a proper PTO shaft. I purchased the PTO chipper 0n 3/4/18 received on 3/12/2018 followed instructions to install, only to find the included PTO shaft too short for my tractor. Per instructions I called DR power and after a few days they said they would send a replacement PTO. as of 3/29/2018 replacement pto has not been shipped and no one at DR power is returning my email. It would be much better to ask what tractor before purchase and send the correct PTO originally. Over all I'm satisfied with the wood chipper after my first time using it. My only disappointment so far is with the information provided in the Manuel. It does not provide dimensions of the PTO shaft end that connects to the chipper. Works only when I put cement block on the seat. Response from DR SupportThank you for taking the time to write a review of the Self-Feeding 3pt Hitch Wood Chipper Shredder. Many tractors have an operator's presence sensor in the seat. We recommend contacting your tractor dealer and they will be able to offer an easy solution. We hope the Chipper Shredder itself is working great for you! Powerfull chipper.Since I chip all blue and black oak I would recomend buying an extra knife or 2 to start.This oak is very hard. Everything I'd thought it was going to be. Quality machine that does exactly what it's supposed to do. Easy assembly, clear instructions. Works like a champ. Would appreciate the ability to adjust the mounting points use quick attach lift. Disappointed in the packaging for shipping. The chipper works fine but arrived pretty scared up. The chipper was laying directly on the feed chute leaving a gouge down to bare metal across the entire front of it. Two of the shields were also bent up. Chipper worked great especially from the power take off on our small tractor. Fed 4.5" tree limbs through without a problem. Extended chute was very useful as it can be turned to shoot into a truck bed. Easy set up. It ate everything I put in it including some limbs that were at the max it was designed for. I have only used it twice for a total of about 5 hrs. I fully expect it to last a long time. Works well, 3pt Top link connection could use a redesign. Chipper works well, has chipped everything I've thrown at it from beech to pine. My only dislike it where the top link attaches on the chipper, it prevents the chipper from being fully raised because it binds with the cover of the chipping flywheel. If the top link attach point was redesigned it would be perfect. The chipper is breat and does what you said it would. The unit works great and performs even better than I expected. I am impressed at what it will eat. The workmanship is good and I didn't need to "fix" anything before I started. Well satisfied. Easy to assemble, easy to use. I have a 20 HP tractor. Put a 4.5 log in unit and it ate it up. would recommend for purchase. RD. This is my third year using this chipper. I have a John Deere 1026 series 1 tractor. My wife and I have 70 acres of land and we live in the Tug Hill region of Northern New York. This past winter we got over 325 inches of snow and it bent many of the tag alders over that line the access road to our property making it very difficult to access the property. This past Sunday I spent over four hours cutting well over one hundred tag alders. About 25% of them were three plus inches in diameter and between 20 to 25 feet long. I ran the chipper the whole time and chipped everyone of the trees I cut down. The chipper performed just like it is advertised. It exceeded my expectations. I highly recommend this piece of equipment if you need to do this kind of road/trail maintenance. This would have been a 5 Star but a few negatives. 1st big one is that the 3 point width is not in spec for a quick hitch. Very big bummer as all new 3 point stuff I have purchased in the last few years fits the cat 1 quick hitch. This will not as it's too wide. One of the pins was all chewed up on shipment but I had a spare. I am guessing DR would have got me a replacement quickly though so no fault on them. Secondly the paint. The hopper fit and chute was not the best and once it did snug up with the bolts (that did not match the bolts in the instructions) the powder coat paint "Popped" off a few spots. If not for those issues it would be a 5. Other than that it does what it's supposed to do. On a plus side it matches my Kubota. It works quite well. I had no trouble assembling it. I don't put in 4" trees as I put those in my fireplace, but it did 2-3 inch trees quite easily. It's fairly quiet also. Works very well. The position of the chipper when mounted on the category 1 three point hitch is a bit close when transporting, so it shifts left and right a little. I cannot seem to adjust that out. But overall satisfied with the chipper. This Chipper is worth what I paid, from the 3-point hitch to the self-feeding, it works great. I have an older model that i got from my sister-law 25 years ago and that is still running. I think this chipper will outlast me. This chipper was very easy to assemble and was up and running in no time. My seventy-year-old step mother-in-law helped me work on a very large wood pile I'd been accumulating from a few years' worth of ice storms. In just a couple of hours we had it whittled down to half. The three-point hitch makes it easy to move, just drop it to idle and disengage the PTO. When it stops spinning merely lift the chipper, take it where the work is and lower it. Drop back to an idle, slowly engage the PTO and gradually bring it back to PTO engine speed. I will admit that after half a dozen moves the PTO shaft end flew apart as I was increasing the engine speed and the shaft fell off damaging the chipper drive shaft in the process. I was very concerned whether they would stand behind it as the PTO shaft was sent by DR but not manufactured by them. One phone call and the parts (both the PTO drive shaft and the Chipper drive shaft, along with the hardware)were shipped to me, no questions asked! I am planning to buy the stump grinder next season and the Versa-Pro Z-Mower soon thereafter. Great chipper - been put to the test! Bought this chipper in 2009 as we were clearing land for a garage. I figured the 1 year trial period would make or break this machine. Assembly was pretty easy though I did run into a problem with the PTO shaft not fitting on the chipper. I called DR and they sent another shaft. Unfortunately the problem was with the shaft on the chipper. Their solution was to sand down the shaft until I could slip the PTO shaft on. Not a good solution in my opinion but... After a couple of hours of sanding it finally went on. I ran it on a Kubota B7610 for several hours and it ran great. Only issue with the 7610 was when I tested it with a 4" oak branch to see how it would handle it. Bogged down a bit. Overall though I am quite impressed with the chipper and I only chip branches 2" or less. No other issues have come up in the past five years. I did some maintenance to it -changed the cutting blade, lube, etc and it was pretty easy to do. I remove the hopper for storage every year and I have since removed the PTO shaft and put it back on without any problems. I upgraded to a B3200 this season and tried another 4" oak branch to see how it would handle it... No problems at all! I'd recommend this chipper to any homeowner/ small farm owner looking for a well built (commercially built???) chipper! unlike most people I was able to go to the DR Power Store in Vergennes VT to get my chipper. The staff there are amazing people to deal with. They had no problem removing the chipper from its crate, assembling it and loading it into my truck for me. I have used the chipper for approx. 2 hours now on a 23 horse kioti and it is still going strong. I stopped and checked every bolt on the machine, not one was loose. I have been feeding it 1-4 inch pine, beech, and even some cherry. There seems to be no stopping it. Above all I have absolute faith in the made in America quality and (for me) local product support. Just used the chipper and took a large pile of brush and reduced it to chips in no time.. Works like advertised.. Hook up to the back of my friends Kubota with no problem... Now for this issue and why a gave 2 stars in the quality department.. When we went to assemble the unit we immediately ran into a problem with the Hopper fitting into the chipper intake.. We tried to maneuver the hopper in several different positions , read the instructions over and over to see if we were doing something wrong.. After further looking into the issue we determined that the reason why it would not fit was because it was getting hung up on two welds on the top of the chipper intake.. Looked like the weld puddle was excessive and with the combination of the paint it prevented the hopper from sliding in.. We did manage to get the nut on the end of the bolt ( barely) and the hopper is on secure but it would of been nice if it fit like it was suppose to.. I did call DR to report this so they can review their manufacturing process and perhaps add a step to actually put together prior to shipping.. I still like the product, it works like it suppose to, in fact I own 3 DR products, brush mower and leaf vac and both run great.. I got speedy shipment and as with all DR equipment I am impressed with the quality. The product eats the limbs up but you do have to trim up some small branches. The only problem was when I tried to feed a large old locust limb but it ate up other large limbs with ease. We recently had some logging done so it will be put to work when the weather turns cold and the snakes are gone. Thanks for a great product that will save me from trying to burn brush piles. I would give this an excellent rating except for hook up. I have a 23 hp kubota the driveline is way to long & the 3 point hitch is extremely difficult to hook up. I plan on doing some modifications when warranty runs out. Once its hooked up it does everything that they say it will. due to weather haven't used my chipper as much as I would like, but when I have it has been great. I shoot my chips straight into my truck with the extended chute I purchased and unload right where I want. Could not get limbs to feed into the chipper. Had to trim each limb so that there was not anything left to catch when going into the 4" opening. Took a long time to chip a very small pile of limbs. Response from DR SupportThank you for posting a review of the Three Point Hitch Chipper to our website. The opening at the base of the hopper is approximately 4 ¾” x 7” so anything wider will need to be trimmed or if pliable enough pushed through. The chipper arrived on time, was not difficult to assemble and works exactly like it was advertised. Makes quick work of limbs and handles 4" trees like they were butter. I have had the chipper for a couple months now and so far it has worked great. Having it hooked up to the tractor makes it easy to move around wherever I need to go and makes quick work of everything that I have tried putting through it. I bought the chute to go with it and that helps to make sure the chips go where I want. The DR 3-Ponit Hitch Chipper was purchased by the family for a gift for my 75-year-old father. He LOVES the machine and has spent hours chipping branches from logging that has been done on his land. The chipper has worked well and chips the wood well enough to be used for burning (when it's well dried) and for use in mom's flower gardens to make them "weedless!" It's been a great addition to the arsenal of tools he owns on the farm and makes his work easier, safer, and more efficient! Thanks for the great service and communication on this order. It will make short work of all your trimmings and turn them into usefull mulch. I was a little unsure of how this machine would behave with my very old Ford 600 tractor. After a short time of learning the routine of what to do and how to do it i felt like I had been using it forever. Now no matter how big the brush pile it is mulch in just a short time. Oh yes I must mention I am 67 years old and maintain our 10 acres of North Florida land with this and two other pieces of your fine equipment. I have owned the 3-point hitch rapid feed chipper for four years. I have found it easy to use and very handy around my house. It is very easy to hook up to my tractor. The entry angle on this chipper makes chipping large quantities of branches easy. Most normal size limbs self feed while you get the next bunch. The larger branches must be held mostly vertical but the load is well supported by the chipper. While I have had no problem, I suggest there be more protection for the user slipping into the pulley wheel that extends down under the chipper without a guard or if the user were reaching for fallen branches about the base. we use this product a lot not only my place but my neibors place Ive had it for some time and love it. It dose all the work I have to do around here This winter we had a lot trees fall over so it well get a good work out this summer.It is easy to use and dose the work fast. Chipper does the job, but is more work than expected. The chipper works well on brush and small branches. We have a lot of Live Oaks with many branches that come at odd angles, and these require quite a bit of preparation to prevent jams in the feed chute . Success comes from proper preparation. I would highly recommend this chipper, but be prepared to learn how to make the most of it. It is physically demanding. No place for bushy branches. There's no place to feed bushy or brushy branches. this product works great reduces a large pile of limbs to mulch in no time at all. from the first time i used the machine, my friend and i backed up and started laughing like a couple of kids, we couldn't believe it!! i used the chips on my drive to keep the dust down out in the sticks, and i brought some home to put in the flower beds around the house. i have 8 acres of raw timber and had looked at the local stuff but decided to pay a little more, with your gurantee i had nothing to lose, and i'm so glad i chose it!! my next purchase will be the grader, i know it will work just as well. anyone who has seen the chipper work are absolutely amazed. This new model replaced my previous chipper (your 18 hp tow-behind) and it chops up substantially larger diameter logs without slowing. The dicharge chute can be aimed in any direstion. I love it! Chipper works great on large branches and goes through a large amount of material without problems unless you have evergreens or small material like leaves on branches. Then it will jam near the output. Taking your time helps keep it from jamming. I can go through a tremendous amount of wood in just one day. Make sure you keep the knife sharp so you don't have to force feed the machine. I highly recommend the DR Chipper. It has surpassed my expectations of what I thought it could do. It is a well made piece of equipment and I have been using it for three years and it is a real work horse. I do recommend it to anyone who has asked about it. The Rapid Feed PTO DR Wood Chipper meets my needs. I originally purchased the smaller chipper as I had a smaller tractor and then after buying a bigger tractor, I needed a bigger chipper. This chipper went up to 65HP and I have used it now for 2 years. It is great for chipping up the branches trom the trees I cut down for firewood., which makes my wife happy as it makes great mulch!!!!! The PTO chipper has been very useful to us when clearing the overgrown pasture on our 23 acre land. It has been good for creating mulch to use on our pathways. This is a good chipping product.. does not bog down, like a gas model I have. (troy built) I like to let the tractor move it around, the gas one I have is hard to move around. It makes little piles out of big ones fast. We love our DR weed eater. We got the one we have about 30 yrs ago and use it a lot. Our's is just about worn out but it still works even tho a replacement would be extra nice. It will cut the little stuff like grass around door steps and concrete slabs, as well as the big stuff like dog fennel that has grown tall and tough. You can get it in places you cannot get a regular weed eater. when you live among many trees, it's a must to clear for the breeze. It's good to have a dr product that leads the way. We really like DR quality products!!! We have a rototiller, 3pt hitch chipper and brush mower. and find each to be a plus in our arsenal of farm equipment. We also inherited an older model of the trimmer/mower, which we use quite frequently. We are impressed with the new line of products we see with every new catalog. Keep up the good work!! While I ended up with an older model that was left over from the warehouse clearance, I'm still very pleased with the results. I have a new 40 acre parcel and clearing some trees around the home. I got this unit right away to hook up to an older Ford9N and the chipper can handle anything I throw down its throat. I prefer to keep the larger branches for firewood but once in a while its awesome to see how fast it can make a 10ft branch disappear into great looking mulch. I originally thought I was getting a top chute discharge with a larger feeder but this unit still does the job. I just have to do some shoveling to get chips loaded up. I probably ran this thing for nearly 12hrs total so far with a few 3hrs straight sessions and never seems to miss a beat nor has it gotten dull. After purchasing other DR products, we knew our next product would be a DR CHIPPER. We didn't want another piece of equipment that needed fuel or oil or occasional tune-ups. DR provided us with exactly the right product - again! Q.I have a old Ford 8N tractor. Will it be sufficiant to power this chipper? A.The tractor requirements for the Three Point Hitch Rapid Feed Chipper are as follows, Must be a Category 1. Must have a HP between 19 and 65. The 2 outside pins and top pin must be 7/8" in diameter. If your tractor meets the above requirements, the Chipper will be compatible. Thank you for your inquiry. 201 people found this answer helpful. Q.Where is this chipper made? A.The chipper is manufactured in the state of Pennsylvania. Q.How long does the blade last? You also have conflicting answers about where the blade is manufactured. A.The Chipper Knives are made of D2 Heat Treated steel. They are made in China. The machine is made in America. The time between sharpenings will depend on what gets put through the Chipper. The type of wood, moisture content and "cleanliness" of the wood will determine the time. It could be as little as 2hrs or as many as 20hrs+. I have heard both from customers. 130 people found this answer helpful. Q.My tractor pto shuts off if I get out of my seat, how does the chipper continue to run if this safety feature is active on my tractor? A.You will have to install an over ride switch for the PTO in order for the Three Point Hitch Chipper to work. Please contact us if you have any more question's. 98 people found this answer helpful. Q.How dose this chipper work on smaller leafy brush and limbs with pine needles? 73 people found this answer helpful. Q.What size openings are in the chipper screen that this unit ships with? A.This Chipper does not have a screen. I believe you are referring to a Chipper Shredder. Our Chippers produce a chip that is about 1/8" thick and the length and width will vary depending on the size of branch being fed into it. Generally the average size is about that of a nickel. A.Yes, it will work great on your Cub Cadet SC2400. Your Cub Cadet is a catagory 1 tractor and your PTO rotate's at 540 RPM which is what is required. 71 people found this answer helpful. Q.Can this category 1 chipper fit my category 2 tractor?I would like to use it on my Kubota B7100 (category 1) and my Belarus 572 (category 2). Is there anyway to use it on both? A.It will fit if you use Link Reducing Bushings on the Cat 2 Tractor. 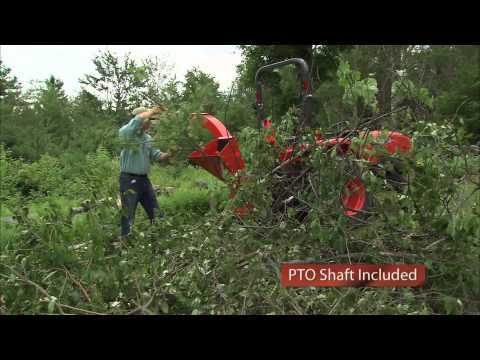 The PTO Shaft may not be able to be swapped due to length. The Belarus 572 is at the max on HP so you may want to throttle down a bit to play it safe. 68 people found this answer helpful. Q.Is this 3 pt chipper compatable with John Deere "i" match quick hitch? A.Unfortunately, the DR 3-Point Hitch Rapid Feed Chipper is not compatible with the John Deere iMatch Quick Hitch. If you have more questions, please feel free to call our Technical Support Department directly at TOLL FREE 1-888-550-0062, Monday thru Friday 8:00 am to 6:00 pm and Saturday 8:30 am to 5:00 pm, Eastern Time. We can also be reached at our email address, info@drpower.com or on Live Chat at www.drpower.com during regular business hours. Q.Does the upper limit 65 hp tractor size refer to PTO horsepower, instead of tractor engine horsepower? A.Powered by your tractor's engine, the 3 Point Hitch Rapid Feed Chipper mounts to a Category 1 Tractor with a maximum engine horsepower of 65 HP. Q.What is the minimum horse power of tractor required to operate this chipper? A.Thanks for asking your question. The minimum HP is 19HP and the maximum is 65HP. And must have 540 rpm setting for the PTO. The 3 Point Hitch DR Chipper will work very well with your Kubota BX 2200. Your Kubota is a category 1 tractor with a rear pto rpm of 540 which is what is required. Q.Does the 3pt. hitch/PTO have a safety kill switch for the operator standing next to the unit? A.Thank you for your inquiry. The 3PT hitch PTO driven Chipper does not have a safety kill switch on it. It has only a belt, a shaft and a flywheel with knife. I hope that this answers your question. Q.What is the difference between the PTO DR Rapid-Feed Wood Chipper (#CPR3PTR) and the DR Wood Chipper/Shredder (#CSR3PTT)? A.The main difference is the Chipper/Shredder has the Shredder compartment. USING THE SHREDDER HOPPER The shredder hopper is located on the top of the unit and is the opening into which all materials to be shredded should be fed. Most organic materials can be shredded. A flex guard, or blow back shield is secured to the hopper. Material must be pushed past this flap using a wooden stick in order to enter the main chipper-shredder chamber where revolving steel hammers do the shredding. The blow back shield is an important feature. It prevents kickback of materials! Do not use your machine unless the blow back shield is securely fastened in place. Due to the wide variety of materials that can be shredded, and their very different physical characteristics, only feed limited quantities of any material into the hopper at first. The amount and length of material can be increased if you find that the material is being processed without any difficulty. Your judgment and operator experience is very important. Be sure not to overload the machine by feeding too much material into the hopper at one time. If you hear the RPM's decreasing, stop feeding material into the machine at once. Do not resume feeding the machine until it has returned to full speed. The maximum diameter of material that can be shredded is: 1. Any larger material should be fed through the chipper-hopper. Material larger than 1" can cause serious damage to any of the internal parts of the chipper-shredder chamber. The unit should be inspected after every use for bent hammers, missing spacers, damage to the screen or any other obvious problems. If damage occurs, the rotor assembly can become unbalanced causing excessive vibration. If used in this state, damage can occur. Do not use the machine if vibration is present. Vibration is generally a warning sign of trouble. Several small branches can be fed into the shredder-hopper at once providing their combined diameter is less than 1 1/2". Branches longer than three feet should be cut to make them more manageable. Green materials should be allowed to dry, or processed in small batches with dry materials to avoid winding around the rotor assembly. MATERIALS BEST SUITED FOR SHREDDING: Leaves, Roots, Grass clippings, Straw, Hay, Small branches, Flowers, Soil, Garden debris, Hedge clippings, Kitchen Waste, Manure, Corn Stalks, Palm frond tops, Potato vines, Tomato vines, Paper. Q.I own a saw mill, will the chipper do scrap wood ? A.All models of the DR Chippers are designed to handle any wood that can fit down the hopper opening (within the maximum diameter ratings) and make rigid contact with the knife-edge. With the 3-Point Hitch Rapid-Feed Chipper, it can handle woody material up to 4-1/2" thick. Q.is it dual use?Has this chipper ever been used to chip / grind corn, cob and all and stalks. I would like to find a wood chipper to use for brush, but also to grid corn and stalks for feed. One machine many uses. No need to purchase a machine that you only use 2-3 months a year. A.Here are the tractor requirements for the 3 point Chipper to work correctly: The tractor needs to be a Category 1 with a minimum HP of 19 and a maximum HP of 65 and there needs to be 540 rpms at the PTO. If your John Deere meets these, you should be all set to use the 3 point Chipper. Q.I'm looking at the three point hitch chipper for a John Deere 1026r tractor, which has a "limited" category 1 hitch. Does this chipper fit? As I understand it, the limited refers to some of the dimensions of the hitch, not the lift capacity. Thanks. A.Our 3 Point Hitch Rapid Feed Chipper will mount to a Category 1 Tractor up to 65 HP. You need to run the PTO at 540 RPM when chipping. The limited Category 1, 3-point hitch is standard for quick hookup of 3-point hitch implements. Industry-standard link and connecting point specifications for Category 1 hitches are met, allowing implements to easily connect to the tractor. However, the low profile on your model tractor may prevent the hitch from lifting some implements to the minimum height prescribed by the Category 1 standard. Q.Will this product work with my Kubota B7300? We recommend a category 1 tractor with a minimum of 19 hp for the DR 3 Point Hitch Chipper. Your Kubota B7300 is a 3 cylinder diesel, category 1 tractor with the PTO rpm at 540 which is perfect, so it will mount up to it. However, I see it rated at 16hp with a rating of 12.5 hp at the PTO. We recommend a minimum HP rating of 19 to be able to handle up to 4.5 inch diameter branches. The smaller than recommend HP might be an issue. Q.I have a Kubota with a 62 HP at the pto. Will your DR rapid feed wood chipper fit and work on my tractor? A.The 3-Point Hitch Rapid Feed Chipper will mount to a Category 1 Tractor up to 65 HP. This machine is designed to operate at 540 RPM only. The 3-Point Hitch Chipper has a 55 pound flywheel that spins at 2071 RPMs and can easily handle woody material up to 4-1/2 thick. Q.What is the minimum pto horsepower recommended to operate this machine? A.Hello, the tractor requirements for the 3 point hitch Chipper are: Category 1 tractor, 19hp-65hp, and 540 rpms at the PTO. Please let us know if you have any other questions. Q.My tractor has 2 speed pto 540 and 720 will the dr chipper operate on the higher speed ? A.It is not recommended to run the chipper on the higher rpm speed at the PTO. It is rated and tested for use at 540 RPM at the PTO. Q.Will this 3-Point Hitch Chipper fit my John Deere X749 lawn mower? Must be a Category 1. Must have a HP between 19 and 65. The 2 outside pins and top pin must be 7/8" in diameter. If your tractor meets the above requirements, the Chipper will be compatible. Thank you for your inquiry. Q.Does the tph450 work as a shredder also? A.Hello Art, thank you for your question. The DR Self-Feeding 3pt Hitch Wood Chipper has only one dedicated chipping hopper. This machine is not intended for shredding. Please feel free to contact us if you have any other questions. Q.How many knives does this chipper have? A.Thank you for your question. The Three Point Hitch Chipper has one knife. It is 6-1/4"x 1-1/4"x 9/32" and made of heat treated D2 tool steel. A.Thank you for your interest in the DR 3 Point Hitch Chipper. The hopper can be easily removed, simply remove the 6 bolts that hold it in place. You only need 2, 1/2 inch wrenches. We do have a tech team here for you if you ever have any questions. They can be reached at 1-800-376-9637, option 2. Q.I have a mahindra 3616 tractor, will this product work for me? A.Our 3-Point Hitch Chipper is compatible with 19 HP - 65 HP tractors equipped with a Category 1, 3-Point Hitch, PTO needs to run at 540 RPMs when chipping. Powered by your tractor's engine, the 3-Point Hitch PTO Chipper can easily handle woody material up to 4-1/2" thick. This Chipper has a large vertically-oriented hopper that directs material into the chipper blade. Most material will self-feed, saving you time and energy. Q.I have a JD2210. Is it large enough to operate this unit?